Virginia Louise Battaglia Davison, 96, of North Charleston, SC, died Wednesday, July 11, 2018. Her funeral service will be held Friday, July 13, 2018 in the J. Henry Stuhr, Inc., Northwoods Chapel, 2180 Greenridge Road at 11:00 am where the family will receive friends one hour prior to the service. Burial services will be held next week in Henlopen Memorial Park, Milton, DE. Virginia was born July 4, 1922 in North Attleboro, MA, daughter of the late Joseph Francis Roy and Lillian Bristow Roy Battaglia. 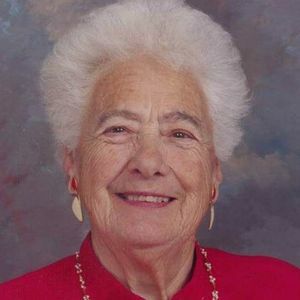 During WWII she was a riveter and welder for an Aircraft Plant in Buffalo, NY. She formerly worked as a meat wrapper in New Jersey. Virginia was a volunteer for Meals On Wheels and a mentor at Presbyterian School in Milford, DE. She was a member of the Milford Senior Center, AARP Aide for two years and worked at Kent Sussex Industries in Woodside and Bridgeville, DE. She was the Delaware Governor's recipient for volunteer of the year. She is survived by three sons: Kenneth Allan Coates of North Charleston, SC; Daniel Lee Coates both of North Charleston, SC and James Donald Coates of Independence, OR; daughter, Sandra Jean Aliano of Monroeville, NJ; nine grandchildren and thirteen great-grandchildren. She was preceded in death by her husband, William A. Davison. Memorials may be made to Faith Assembly of God, 337 Farmington Road, Summerville, SC, 29483. My deepest condolences goes out to you, your Virginia "Gin" will be missed by her traveling family Get Up 'N' Go Tours. Life Stories provides friends and families a forum to post their favorite stories and memories of Virginia Louise Davison ensuring the precious experiences are never forgotten. Share joyful times, post a photo that captures the moments you cherish, and allow others to reply, relive and remember.